1989 37ft Jefferson Viscount Motoryacht 1989 37 ft Jefferson Viscount Motoryacht with a 14�2 Beam. This a very spacious and roomy layout for a 37 footer! Two Stateroom - Two Head layout, the Forward Stateroom has a separate shower stall, the aft Master has a walk-around berth! She has a spacious, well equipped Galley with an opposing Convertible Booth Dinnette. The Salon is spacious and comfortable with excellent visibility at the lower station. Both the bridge and back deck are enclosed and offer ample seating for guests. 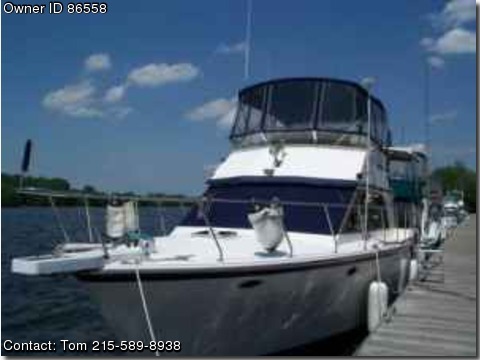 Equipment: Windlass Water Tank: 120 Gallon Remote / Control Search light Two Zone Aqua-Air Reverse cycle marine air Radar Arch with Radar Auto helm Trim Tabs Two 210 Cummins Diesel Engines Lower & Upper Stations Newer Canvas Call Tom for more details at (215) 589-8938.